Occasionally, our hotel room will have a television. However, the selection of English-speaking programs is usually quite dim; in most cases, we’re stuck watching episodes of The Simpsons in German or Friends in Czech. Sometimes, we strike gold and get CNN International. During our months of watching CNN, we’ve been amazed by the continual advertisements sponsored by the Tourism Board of the tiny country of Montenegro. It seems like a Come Visit Montenegro commercial is on every 10 minutes. So, when our friends Todd & Heather Rolapp (who traveled with us in the Czech Republic and Croatia) said they’d like to visit Montenegro to track down some family history, we were overjoyed. Montenegro became part of Yugoslavia in 1922. When Slovenia, Croatia and then Bosnia declared independence in the early 1990s, Montenegro continued a loose union with Serbia until it achieved independence on June 28, 2006 – just two years ago. Until Kosovo declared independence from Serbia just a few months ago, Montenegro was the newest country on the block (it will have to settle for second newest now). From Dubrovnick, Croatia, it’s only a 45 minute drive to the Montenegro border. Once you clear customs, you drive past some fairly unappealing towns and soon arrive in the dramatic Bay of Kotor. 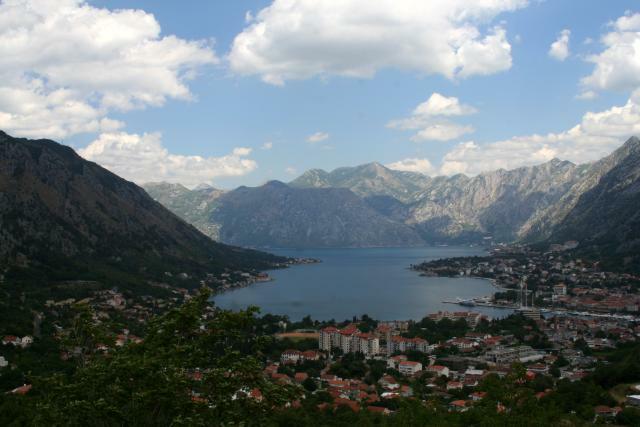 Due to its geographic location,1 the Bay of Kotor has been a strategic area for thousands of years, with Greeks, Romans, Turks, Austrians and Slavs all fighting for control of the Bay. Now, the only fights take place between Serbs and Montenegrins trying to find an empty area along the Bay on which to sunbathe. After circling the bay, we headed up one of the mountain passes built by the Austrian Empire when it controlled this region. Testing my nerves behind the wheel, the road has 25 switchbacks, which are liberally sprinkled with steep drop-offs. As a payoff for all of that effort, it also affords amazing views of the Bay. 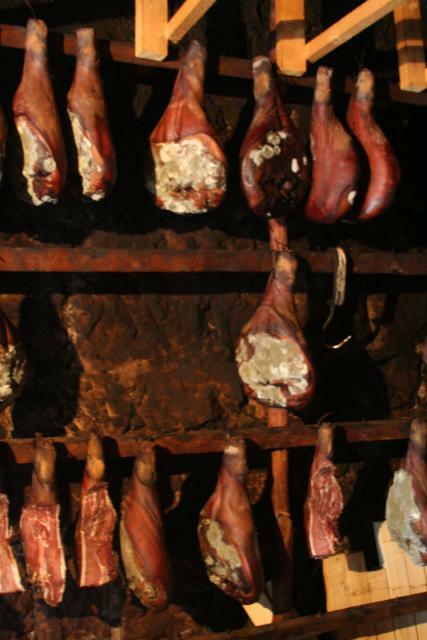 Once we summited the mountain, we wound our way through valleys and hills populated only by sheep and the occasional home selling cheese, smoked ham (basically, Montenegro versions of prosciutto), honey and homemade brandy. After a couple hours of driving, we reached the small town of Cetinje, the former capital of Montenegro. 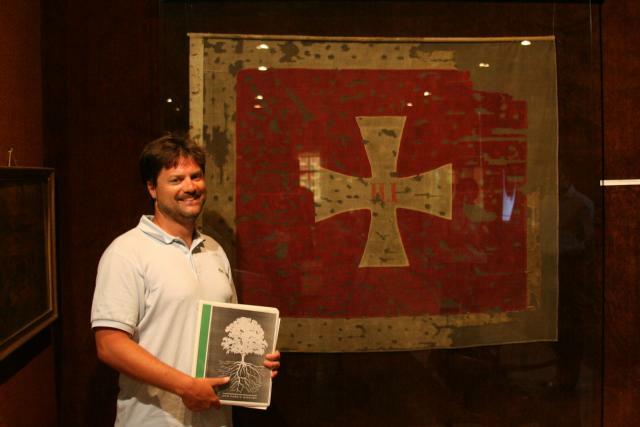 Based on information received from relatives of Todd, two important items could possibly be found in Cetinje: the birth certificate of his great-great-grandfather and a flag that his great-great grandfather rescued from the Turks during the Battle of Vučji Do in 1876. After parking our car, we walked for a few minutes and went into the first building we saw, the National Museum of Cetinje. As we approached the main desk of the museum, a woman who worked there asked if she could help us. As Todd started to explain the story of the flag, the woman quickly interrupted, “Of course, the flag rescued from the Battle of Vučji Do. It’s right around the corner.” Flabbergasted, we went around the corner and, sure enough, we were standing in front of the bullet-hole-ridden flag (over 400 bullet holes) that Todd’s great-great-grandfather had saved from the Turks. A surreal experience. The same woman directed us toward the Cetinje Monastery; just a few minutes’ walk from the museum, it is where local archives (including old birth certificates) are stored. Still stunned by the flag discovery, we entered into the ancient (circa 1484) Eastern Orthodox monastery. After talking to a black-robed priest, Todd set off into the monastery’s archive in search of the birth certificate. 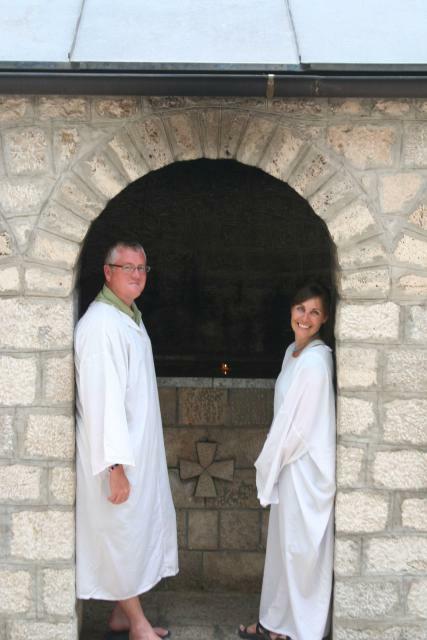 Meanwhile, we donned white robes (since we were wearing shorts) and went into the monastery’s small chapel. 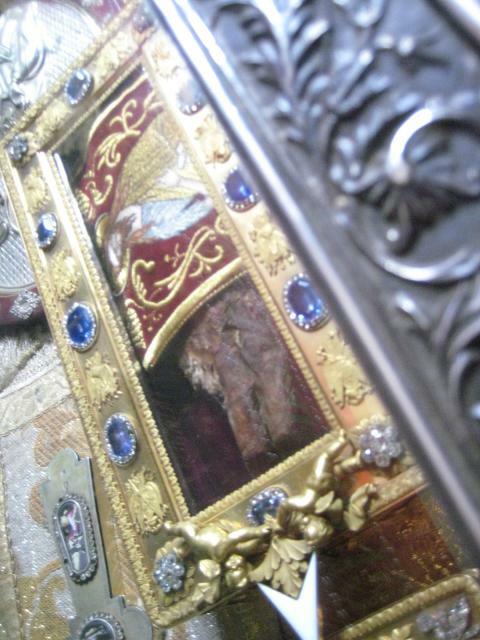 The monastery’s prized possession is the supposed mummified right hand of St. John the Baptist. Evidently, the hand is covered up and only showed on special occasions. Luckily for us, the priests were showing the hand to some pilgrims when we arrived, allowing us a glimpse of the decayed and, frankly, somewhat disturbing relic. Unfortunately for Todd, the priest at the monastery in charge of archives was away on vacation (who knew that Eastern Orthodox priests vacationed?). Todd had to settle for the name and number of the priest-in-charge in hope of getting a copy of the birth certificate if and when it is found. All in all, though, our trip was a success, and one that will be relived every time we see one of those Montenegro commercials during the evening news.